I finally finished the book "Yes! 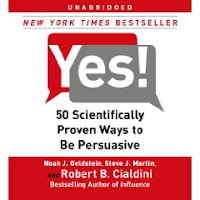 50 Scientifically Proven Ways to be Persuasive," by Robert Cialdini, Noah Goldstein, and Steve Martin. It currently has 4.5 (of 5) stars from 106 Amazon reviewers, and has made the best sellers lists of the NY Times, USA Today, Wall Street Journal, and Business Week. I bought the hard copy about a year ago and tried to read one chapter per day. That didn't last too long and I made it only half way through the book. Then the audiobook version was released and I recently finished listening to it. I enjoyed this book and recommend it. I've already loaned my hard copy to a friend. It's chock full of interesting results from research into what factors seem to influence people. I actually think that I may be able to employ some of these methods. The only challenge is mapping the material into your own domain and situations. I also liked that it's written in a digestible style and not full of jargon. Or, in the words of several reviewers: it's "easy to read".